The RME 6900 offers ham-band-only (1959-style) coverage of 80 through 10 meters plus WWV in a 12-tube, double-conversion receiver. Selectivity is implemented in the 57 kHz 2nd IF circuits. Price when new: USD 349. Some notes: It has Rugged construction, Smooth Main tuning, smooth Band change switch. 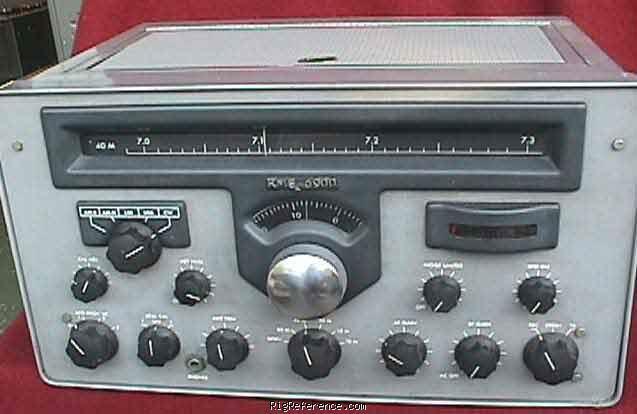 Styling is a bit strange, almost alien like, when compared to other radios of its era. At a glance it is very similiar to a Collins 75-A4. I wouldn't be surprised if this was made as a "knock-off" version. The Rf gain gets a little sensitive at Maximum. But that would be my only downgrade. Serial number on it is #181 Pretty early # so it was probably made in Late 1959. Estimating the value of a rig can be challenging. We collect prices paid by real hams over the years to help you estimate the current value of the RME 6900. Just bought or sold this model? Let us know what you traded it for and help other ham operators!